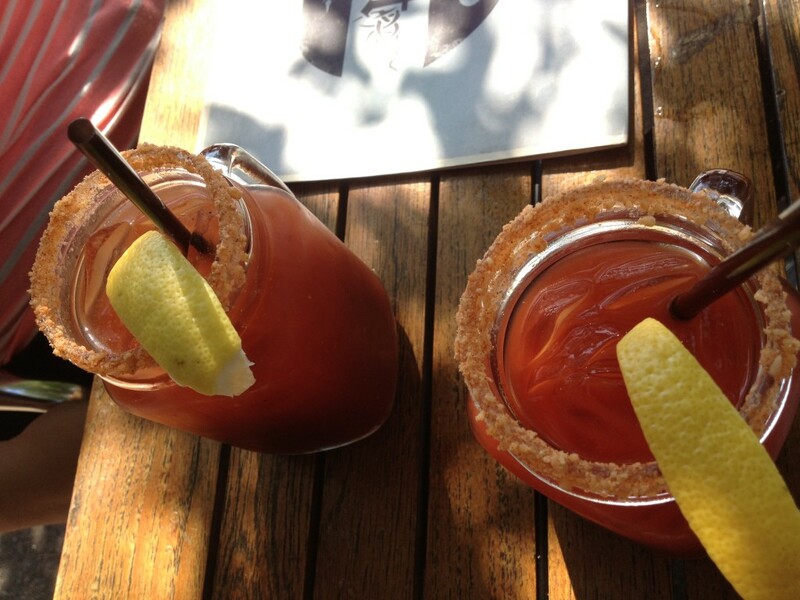 Chicagoans take their brunches very seriously. Rockit Burger Bar is no exception. I recently had the opportunity to indulge in this Wrigleyville hot-spot’s popular weekend brunch. Having dined at their River North location for years, I knew this place was no stranger to downright delicious grub. But just how far they take their brunch experience was what really impressed me. Available on Saturday and Sunday from 10:30am-4pm, Executive Chef Amanda Downing whips up sweet, savory, and super mind-blowing concoctions. 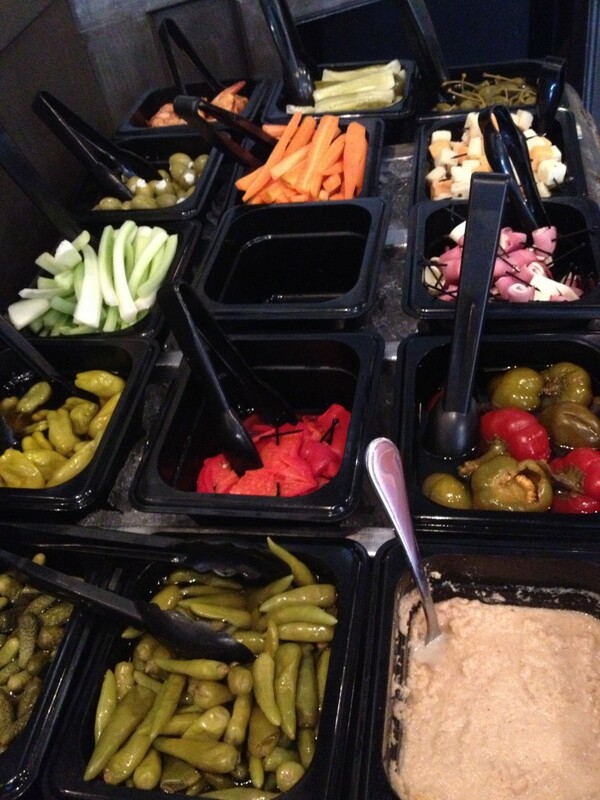 To say “come hungry” would be an understatement. In fact, “Come with the biggest appetite you can find and ready to divide and conquer,” would be more like it. Our meal began with the sausage and egg flatbread pizza. 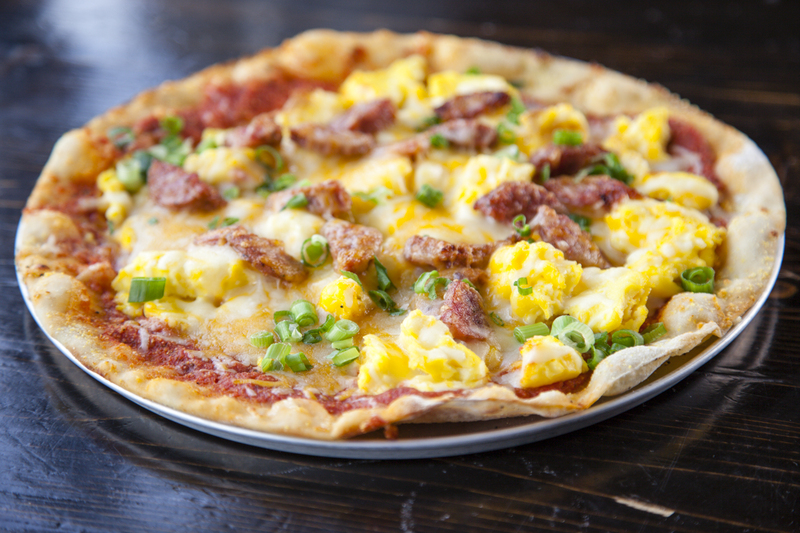 It had a crispy crust and was topped with pork sausage, scrambled egg, scallions, cheddar, and tomato-basil sauce. I never before thought of putting regular pizza sauce on a breakfast pie, but this certainly changed my mind. 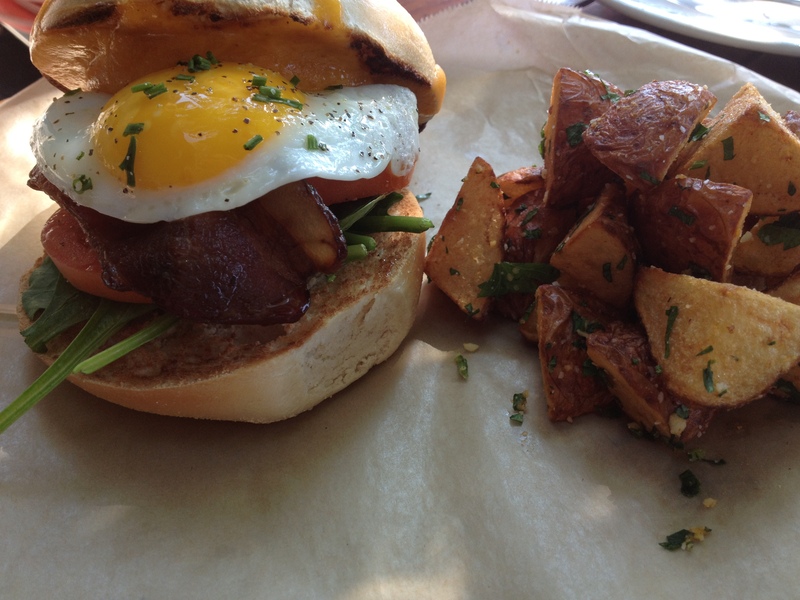 Next, we cut into their version of a BLT breakfast sandwich. Stacked high on a pillowy plain bagel were pieces of thick-slab bacon, a juicy tomato, a gooey fried egg, and some spinach. This was coupled with fried diced breakfast potatoes. Large, indeed, but everything worked lovely together and was very satisfying. For those who are a little more adventurous (and hungry), there’s no substitute for the BFD (they say it stands for “Breakfast for Dinner,” I say it stands for “Big F–King Deal”) Burger. 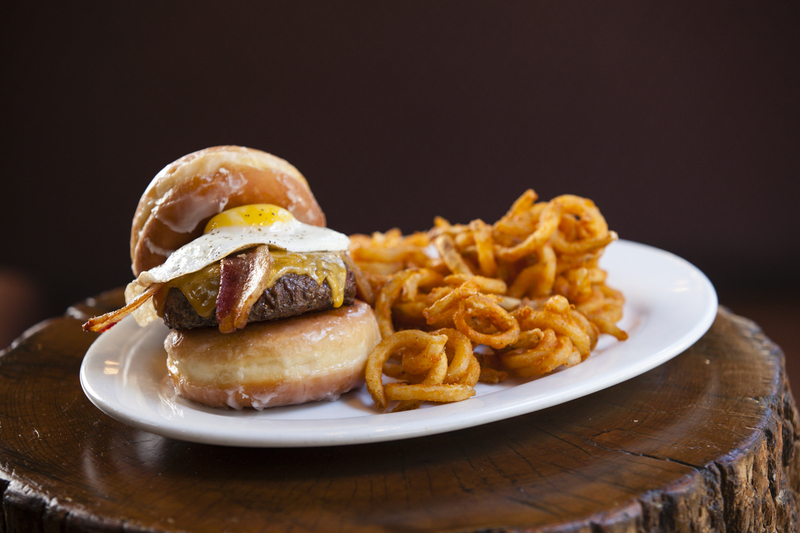 It is a generous black angus patty, strips of applewood smoked bacon, a fried egg, and Hook’s five-year aged cheddar cheese all tucked between two huge, warm glazed doughnuts. 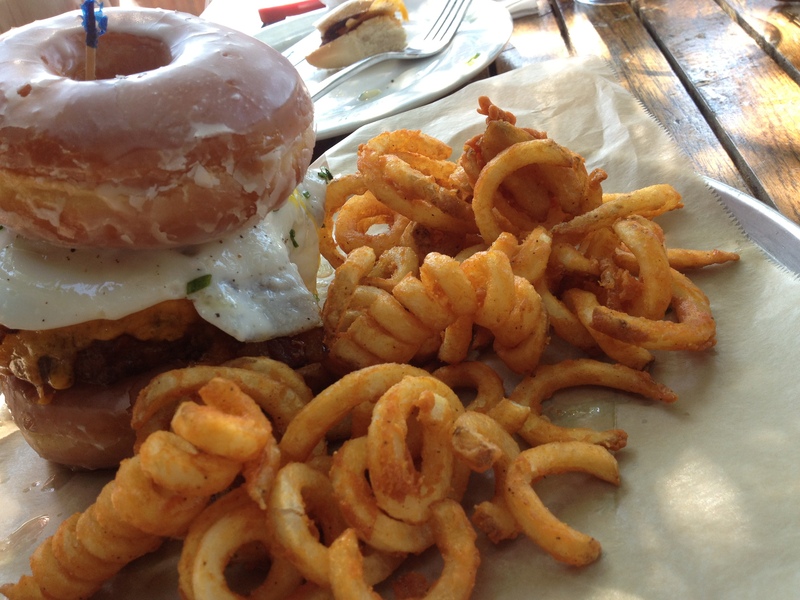 The food monstrosity is served alongside a heaping portion of seasoned curly fries. Besides it being a total gut-busting glutton-fest, the sweet and salty actually worked so nicely together and would definitely be a fun one to order for the table to share. Finally, we capped things off with a belgian-style malted pistachio waffle, which in comparison to the rest of the meal was light and refreshing. 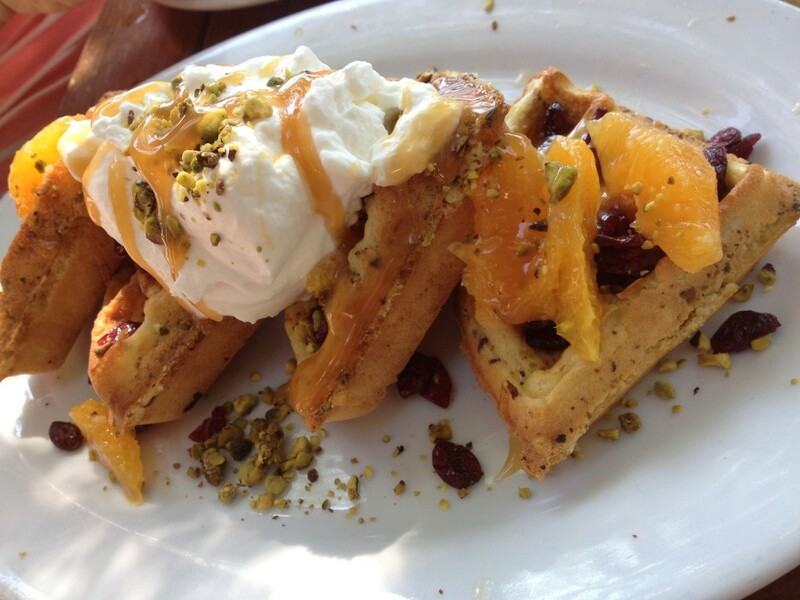 The waffle flavors vary by the week, so ask your server what’s on tap for the day. Rockit Burger Bar is also home to an elaborate “build-your-own” Bloody Mary Bar featuring more than 15 toppings. Easily one of the best mixes in the city, the accoutrements only enhance what’s already a knock-out. 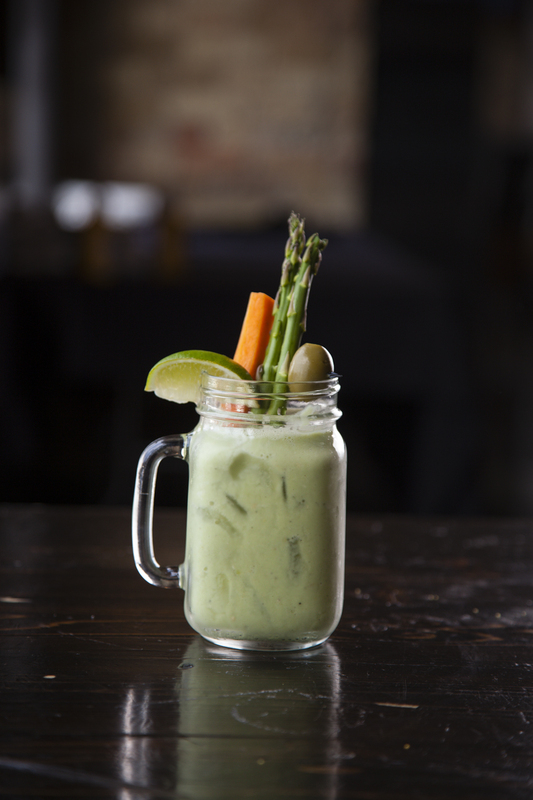 Rockit also released a new zesty Tomatillo Bloody Mary, which features a splash of avocado and jalapeno into the mix. 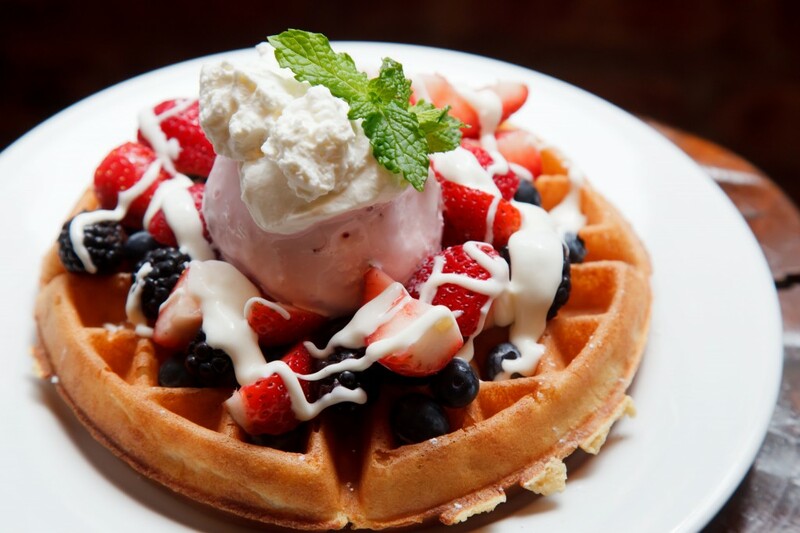 Brunch reservations are encouraged, especially on days when the Cubs are playing. And don’t forget that their outdoor seating is considered one of the largest dog-friendly patios in the city, so you can bring your four-legged friend to help you polish off the BFD!